The historical monuments of Uzbekistan have attracted Western travelers for centuries. 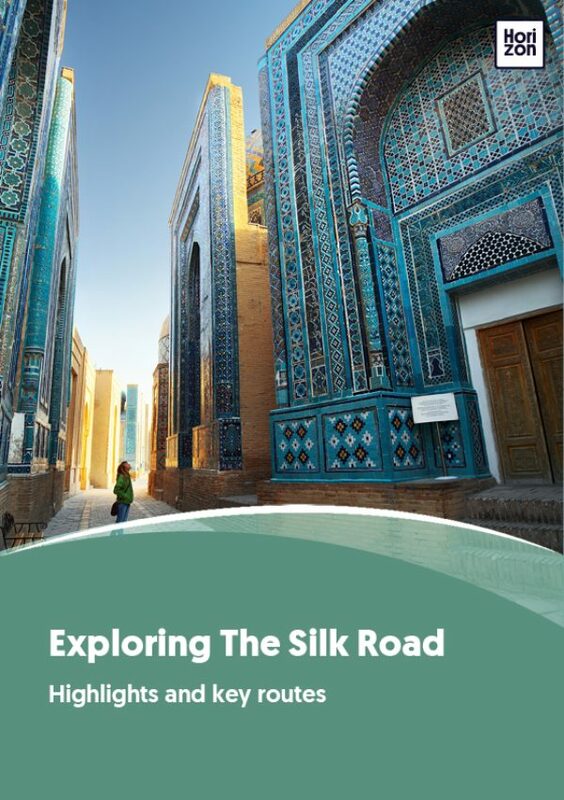 From Marco Polo to the Great Game spies, Uzbekistan was always at the heart of the intrigue, its cities the routers of the great interchange between East and West that we call the Silk Road. But for most of that time it was only the hardiest of travelers risking life and limb who managed to see the great jewels connecting the caravan roads. Since the end of the Soviet Union, however, Uzbekistan has opened its doors to visitors. Visiting Uzbekistan is a feast for the senses, from the wonderful tilework decorating madrassas and mosques to bustling markets and bazaars. Wander through narrow streets along adobe houses and get to know the friendly Uzbeks in one of many tea houses. Spend a night in a desert yurt or in a homestay with a Tajik family, or get spoiled in a boutique hotel instead. As the capital, Tashkent is the logical entry point for anyone flying in and out of Uzbekistan. On arrival, nothing can quite prepare you for the imposing architecture of the former Soviet regime. Most tours will take a full day to explore the city: on one hand, the Brutalist architecture, on the other hand, the remaining Islamic monuments. The Tashkent mosque holds one of the world’s oldest Korans, brought home as a souvenir by Emperor Timur when he came back from conquering Iraq. Dining options in the city are numerous. Afsona might be the nation’s best: its stunning interior design was worked out in cooperation with Uzbek and British designers. The kitchen similarly offers a modern take on traditional Central Asian cuisine, offering vegetarian and low-fat variations on Uzbek dishes. Another popular option is Efendi: Turkish soups and lavash are a delight any time of day. If you want a more local experience, ask your guide for a lunch canteen recommendation: huge, busy leftovers from Soviet times: these offer up giant portions at low prices for hungry students and workers. It’s less than two hours by high-speed train from Tashkent to Samarkand. Most tours will spend at least two nights in Samarkand (see Samarkand: Unique Heritage). There is a direct train connection between Samarkand and Bukhara; you can make the journey in 90 minutes. By car, it’s a four-hour drive, but budget an extra hour to stop for pictures at lost caravanserais and minarets along the way. If however, you can spare an extra two days and enjoy seeing a bit more of local life in between the sights, take the roundabout way to Bukhara through the Nuratau mountains. The petroglyphs all through the mountain range testify to the fact that this was another branch of the Silk Road used by a more ancient people. Nowadays, Tajik people live in the mountains in a rural idylle, and you can join them thanks to a pioneering ecotourism programme. If feeling brave, brace yourself for a camel ride into the Kyzylkum desert. The people occupying the desert are Karakalpaks, traditionally nomads who are more related to Kazakhs. You won’t be sleeping rough, though. Uzbeks have high standards in hospitality, and camp managers here offer immaculately dressed yurts, hot showers, vegetarian options and a local bard by campfire. The starry night sky is unforgettable. Having a good guide in Bukhara is a must. It adds so much to the fabric of the city to see it through the eyes of someone who understands its history. A good guide can also help you shop: Bukhara is a great place to stock up on souvenirs, from hand-painted ceramics to silk scarfs for the relatives. But remember, Uzbeks are a trader nation: if you haven’t bargained, you have been fooled! Bukhara has the best sleeping options in all of Central Asia: top-notch service combined with historic authenticity at boutique hotels like Komil or Amulet represent Uzbekistan at its finest. Al fresco dining under centuries-old plane trees in one of the restaurants surrounding the Lyabi Haus quarter is a must. There is no rail connection between Bukhara and Khiva, so the next part of the journey needs to be done by road-- a seven-hour ride. Its remoteness makes this desert khanate little-visited by the majority of tourists. Khiva is a picture postcard place, unique in the Islamic world for its intact historic center. Those with more appetite for the unusual can take a side trip to the remains of the Aral Sea. Rusty boats lie stranded in the desert with no shore in sight. The man-made catastrophe of the vanished Aral Sea is a reminder of the ongoing destruction of human habitat for economic gain. To cheer you up, visit the Savitsky museum in regional capital Nukus. The museum is a monument of one man’s struggle to preserve Russian avant-garde art from the destructive clutches of the Stalinist regime. Its collection is now only second to that of Saint-Petersburg. From Urgench near Khiva, a flight back to Tashkent brings your journey to an end.